Floriana returned to winning ways as they defeated Pietà Hotspurs 2-0 at the Centenary Stadium on Wednesday. 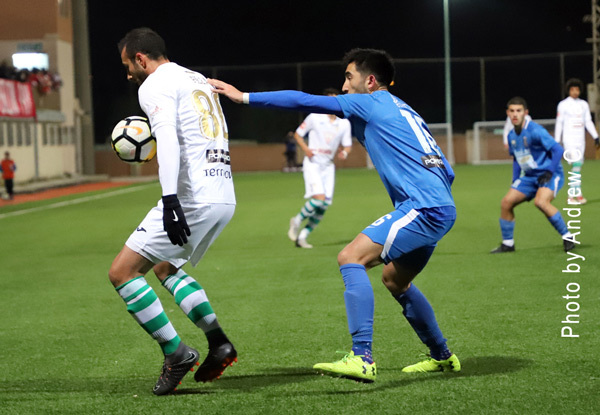 This win puts the Greens in eighth place on the 25-point mark while condemning the Hotspurs to an eleventh consecutive defeat. Floriana took the lead on the 63rd minute thanks to a diagonal shot by Brandon Paiber from the right which beat Nicky Vella. Nine minutes later, Floriana doubled the score thanks to a great first-time volley by Emerson Marcelina from inside the area which gave the Pietà goalkeeper no chance. PIETÀ Nicky Vella, Takaki Ose, Dylan Agius, Paul Chimezie (73′ Nicholas Pisani), Jan Busuttil (81′ James Scicluna), Gabriel Mensah, Juan Manuel Artiaga, Christian Grech Uchenna Umeh, Ishaya Irimiya Jalo (61′ Jake Ghio), Antonio Orlando Macedo Neto. FLORIANA Ini Etima Akpan, Enzo Ruiz, Kristian Keqi, Brandon Paiber (81′ Edward Herrera), Jurgen Pisani, Tiago Galvao da Silva, Alex CIni, Ulises Arias (69′ Clyde Borg), Arthur Oyama, Emerson Marcelina, Lucas Vieira da Silva (61′ Terence Vella).